Periods of extensive work almost always go hand-in-hand with lots of good coffee but there are a few occasions (such as in this past month) where I have so much to do that getting out to get some good coffee becomes a challenge. So after going about a week without a stellar cup of coffee, I made sure to make a couple stops that included a visit to a long-time favorite Crescent Moon Coffee as well as to a new place west of Philadelphia called Burlap and Bean Coffee. Burlap and Bean has been a coffeehouse that I have heard bits and pieces of praise of over the past few months. Word was that they knew what they were doing with roasting and that they've caught the attention of some credible people, but overall I had nothing conclusive. So when I drove into their small strip mall after dinner one evening, the bustling droves of people outside of their big storefront windows proved a welcome sight. Walking in, the inside proved packed and beautifully decorated; gorgeous wood furniture, art mounted on burlap, and a nice color scheme all demonstrated an aesthetically pleasing location to sip some coffee. The coffee is roasted in-house, varying in single origins and blends. I sampled their house blend, which surprisingly blew me away as usually house blends prove normal, but this one had a hopsy fruity mellow flavor that really made me smile. The espresso emanated a floral sweetness and a nice tang, and all in all definitely appeared to be pulled by trained hands. The tea was Republic of Tea. In the end, Burlap and Bean left me a chipper man. Not only was I able to make stops at two good coffee establishments (Crescent Moon was pleasant as usual) but now when I'm in Upper Darby or along I-476 I have a good spot to stop at (probably sooner then later). 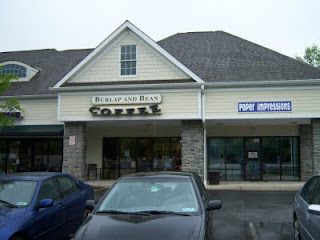 If you are in the area, make sure to give Burlap and Bean Coffee a go. Great place! I discovered Burlap and Bean (B&B as the locals call it) while visiting one of my grad school friends in Philly. It's a cool little shop. She took me out there to catch a local singer. They have live music on most nights of the week. Unlike a lot of other shops, B&B serves food, which was hit or miss. I liked my pork sandwich, but my friend's quesadilla was uninspired.